Shedding light on what might otherwise be a difficult concept to grasp. Perspective is everything. 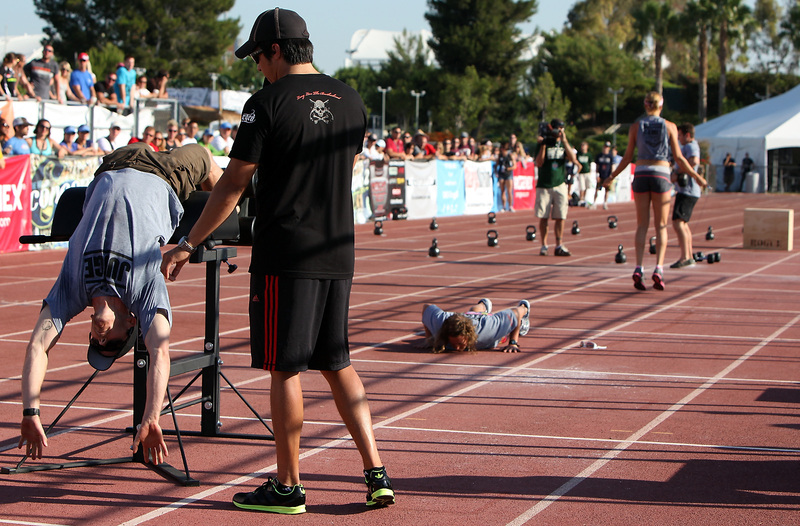 The work being done by Games competitors can best be appreciated by other CrossFitters. Often the Games athletes make amazing feats of power output look like a walk in the park, making it hard for the casual viewer to fully appreciate the sport. 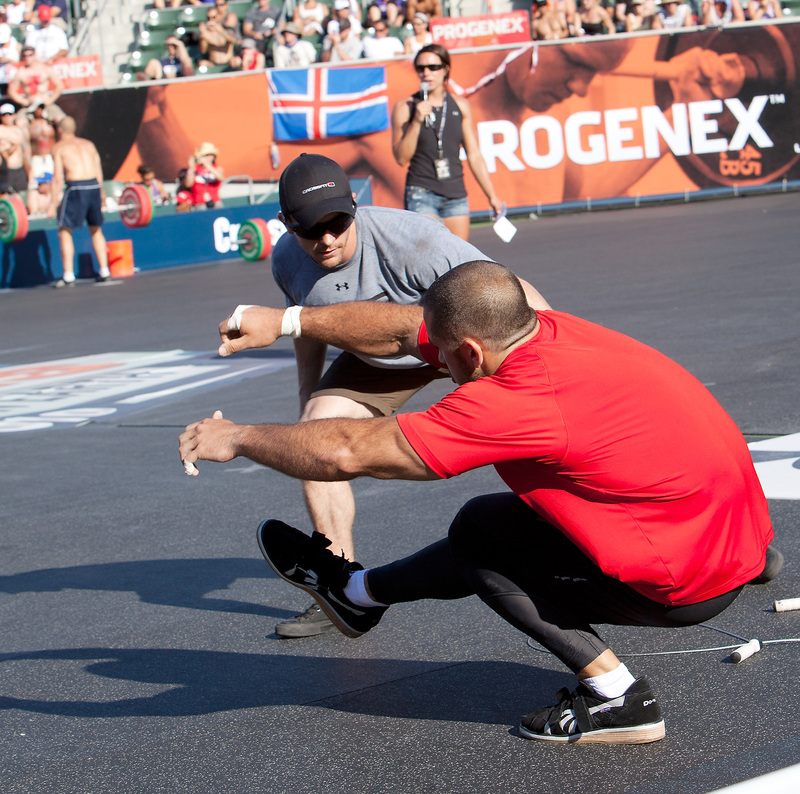 Affiliate owner and HQ trainer Russell Berger is no stranger to CrossFit Games competition. This year he was 6th in the Southeast Regional qualifier, just outside the cut for the final at the Home Depot Center. In his role as a judge he had a front row seat to the action at the HDC. In this video Sevan Matossian asks Berger to shine some light on what the competitors are going through, both physically and psychologically. He also speculates on what it takes to win. Mr. Berger was the only judge I remember from the Games, and I don't mean it as a compliment. 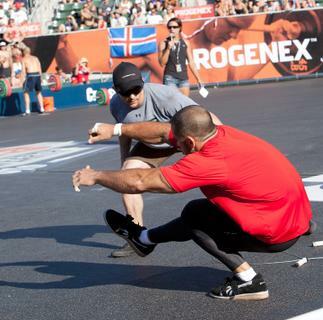 He was making a show of it with his overactive positioning (look at the photo: he's out of position to see if Khalipa's getting depth), wild histrionics, and high school-umpire "NO REP!" calls. Was it a coincidence that he took so many reps away while hopping around like a bunny while other judges kneeled to the side? No. 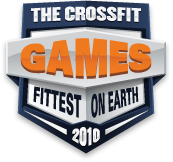 It's great that he thinks CrossFitters understand CrossFit better than people who don't CrossFit (what a novel idea), but his awful judging had more of an impact on the Games than how excited the competitors were on Sunday. 05 August 2010 / 9:40 a.m.
interesting perspective... one shared by many. 05 August 2010 / 6:34 p.m. Here is another interesting perspective shared by many..........Russell did a great job, as did the other judges. 05 August 2010 / 8:34 p.m.
-Russell's position in the above photo is fine. He can see Jason's depth with that semi-profile view. Most athletes rapidly switched legs during that movement which often left the judge to do their job while looking at the non-working leg. I assume you would rather have him view the working leg. If so, I assure you that this was not possible in all situations. -The "no-rep" hand signal ("high school umpire" style) was discussed as the standard sign for ANY rep not counted for all judges at the judges meeting we had on thursday before the games. This was to allow the crowd (and media crew) to clearly identify when a rep was not counted. Russell was one of the only judges that maintained this visual cue consistently and he should not be chastised for following instructions well. It is fine if you don't like that particular signal, but that was not Russell's decision. For most of the smaller heats I hand-selected the judges that would be 'on the field'. I felt (and still feel) that Mr. Berger holds a strict, consistent standard, but is no more interested in taking reps away than any other judge. Several times throughout the weekend he approached me to discuss if he was 'too strict'. He was always open to the feedback I gave him and was one of the only judges to ask about his performance on a regular basis. It's unfortunate if his officiating was that memorable to you (again, we do our best to put the emphasis on the athletes), but I don't feel that he was unfair or had malicious intent during any event. I sincerely hope that your CF Games experience was positive, even if you didn't agree with every call or volunteer involved. 05 August 2010 / 8:41 p.m.
Watch the Helen from hell video and tell me Annie's swings are legit, or Plumey's swings (which were even worse). Kristen Clever (sorry if that is misspelled) made sure every rep was legit and still almost won the event, but it almost cost her the title. Now that money is being offered for the athletes the judging has to be spot on. As for Russel being a bad judge, I don't think he was at all..as for an attention getter, yes. but who cares. maybe all the judges should be like Russel, at least it would be consistent across the board. Again, kudos on the games and it's evolution..... It's very exciting to see where it will go from here. 06 August 2010 / 8:42 a.m. While I was only a Sectional competitor, I wished not only for myself, but for all of the other competitors that a hand signal would have been used in addition to the judge's voice. I found it very difficult to hear the judge (even though they were extremely close) due to the incredible atmosphere creating an abundance of noise. But overall it was great and couldn't thank them enough for giving their time and energy. I didn't think of it either until the competition began and is just another example of an area where improvement can and will be made. 08 August 2010 / 3:55 p.m.